Max Fowler and Adam Goodley have also been cast in the television adaptation of Brian Michael Bendis' comic book series. 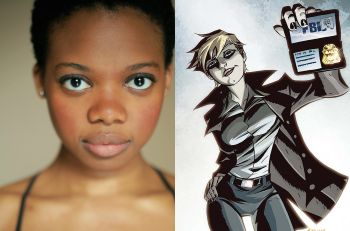 Following a recurring role on the Fox drama The Following, Susan Heyward has been cast as homicide detective Deena Pilgrim in the television adaptation of Brian Michael Bendis' comic book series Powers. Pilgrim investigates cases involving superheroes, alongside her partner, detective Christian Walker. Also cast in the project are Max Fowler, who will play Krispin Stockly, the son of Walker's murdered, previous partner. Adam Godley, known for roles in Breaking Bad and Suits, has also been added to the cast. Godley will play Captain Cross, head of homicide department. The superhero police procedural was announced in March as original content for Sony's PlayStation Network. The Powers pilot will launch for free on the PSN in December, and PS Plus members will have access to the full series. Pilgrim is described as "equal parts beauty and sarcasm, a wunderkind detective with edgy style." In the comics, Pilgrim specifically requests a transfer from the SWAT Team to work on super-powered homicides with Walker. She quickly begins to deduce that Walker's links to people with powers are more than superficial. Casting has not yet been announced for the role of detective Walker. Powers will release exclusively on the PSN in the US, so fans in other countries will likely have to wait for DVD release. On the Comics and Cosplay podcast last month, we talked about our love for the comic book series and our hopes for the television show. Are you excited for Powers? Who would you cast as detective Christian Walker?